It may be a long way from the tree-shaded jungles of sub-Saharan Africa to the TV-lit living rooms of suburbia -- but when it comes to being good at video games, that matters less than you might think. In a recent study comparing the spatial cognition abilities of two closely-related primates, humans and chimpanzees were asked to navigate a series of virtual-reality mazes presented to them on a computer screen. Researchers then recorded how long it took them to complete, as well how much distance they covered to do so. The participants included 16 humans, four adults and twelve children between 3 and 12 years old, along with four adult chimps from the Language Research Center at Georgia State University. Players, competing individually, used a joystick to search through the network of virtual alleyways in search of a goal. Blue squares and brown triangles along the way indicated that they were either on the right track or getting off course. 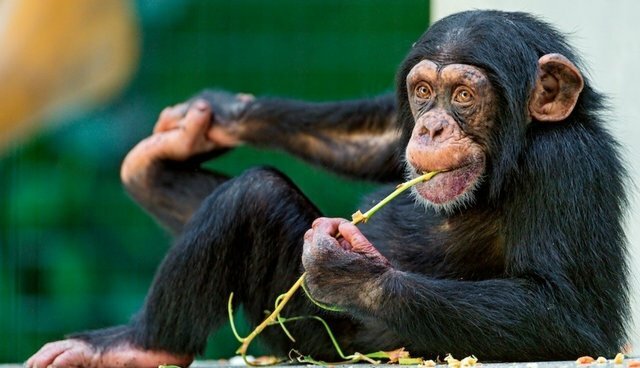 On average, the chimps were able to complete the maze in about the same amount of time as kids aged 3 to 6. And while that alone is noteworthy enough, in terms of "travel efficiency" one of the chimps in particular proved more skilled than most. A 22-year-old chimpanzee named Panzee was found to significantly outperform all the children and several adult humans in navigating the most difficult maze to the end in the fewest number of virtual steps. The study proposes that the chimps' surprising skills in playing the video game likely reflect those instincts they honed in their native habitat, like in using natural landmarks to keep themselves oriented while foraging for food. But before any curious gamers try to bushwhack through the jungles of Africa with a Playstation in hand, researchers note that the chimp participants were already familiar with computer interfaces from previous studies on cognition. Wild chimps, though capable navigators, would certainly fair poorly in a game of Halo. Still, the human players were not always above trying to sneak an unfair advantage over their chimpanzee competitors, says study author Francine Dolins. "If the humans would ask me for answers, I would tell them, ‘I can't give the chimps answers."